 Digitalt Startset "Freight Train SNCF"
Digitalt Startset 'Freight Train SNCF', innehåller ellok klass 7200 typ SNCF och 2 godsvagnar, rälsoval 110 x 50 cm. 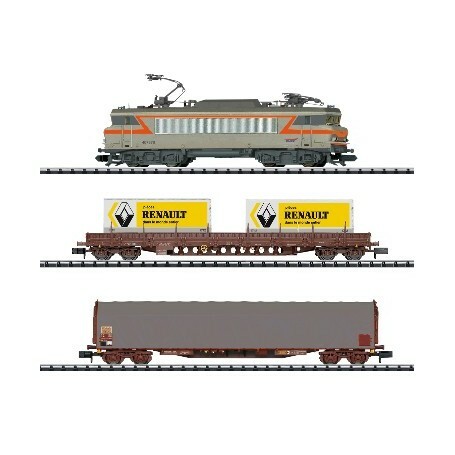 The locomotive frame is constructed of die-cast metal. It has a DCC-Selectrix decoder. The locomotive has a 5-pole motor with a flywheel. The headlights change over with the direction of travel. 4 axles powered. Traction tires. The cars have close coupler mechanisms. A Mobile Station, track connector box, a 230 volt / 36 VA switched mode power pack, and oval of track with Radius 2 curved track are included. Required space: 110 x 50 cm / 44' x 20'. Total length over the buffers of the train approximately 357 mm / 14-1/16'.